Lafayette Class Ballistic Missile Submarine: Laid down, 26 April 1961, at Mare Island Naval Shipyard, Vallejo, CA. 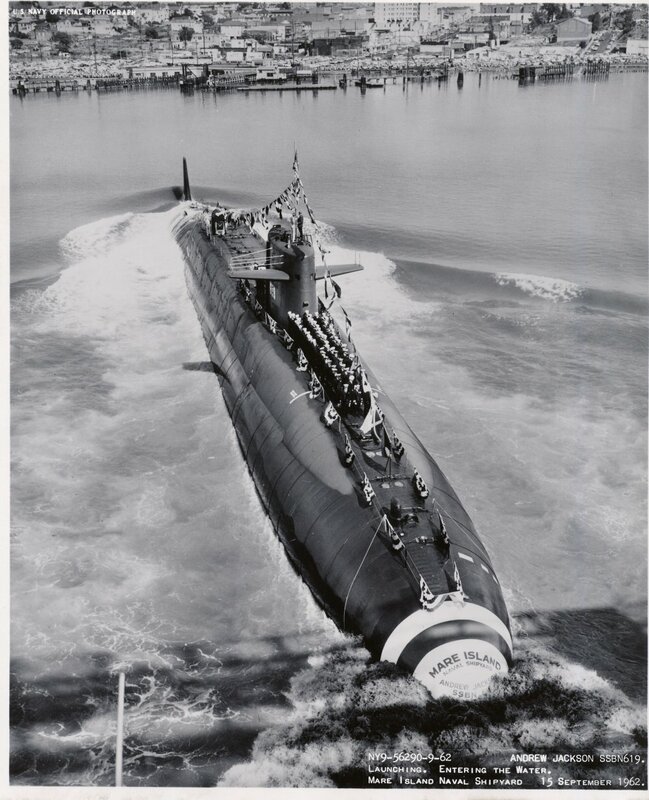 ; Launched, 15 September 1962; Commissioned, USS Andrew Jackson (SSBN-619), 3 July 1963; Decommissioned and struck from the Naval Register, 31 August 1989; Disposed of through the (NPSSRP) Nuclear Powered Ship and Submarine Recycling Program, at Puget Sound Naval Shipyard, Bremerton, WA., 30 August 1999. Specifications: Displacement, Surfaced: 7,250 t., Submerged: 8,250 t.; Length 425'; Beam 33'; Draft 32'; Speed, Surfaced/Submerged 20+ kts; Complement 120; Test depth 1,300'; Armament, 16 Polaris missile tubes, four 21" torpedo tubes; Propulsion, S5W Pressurized Water Nuclear Reactor, two geared turbines at 15,000 shp, one propeller. 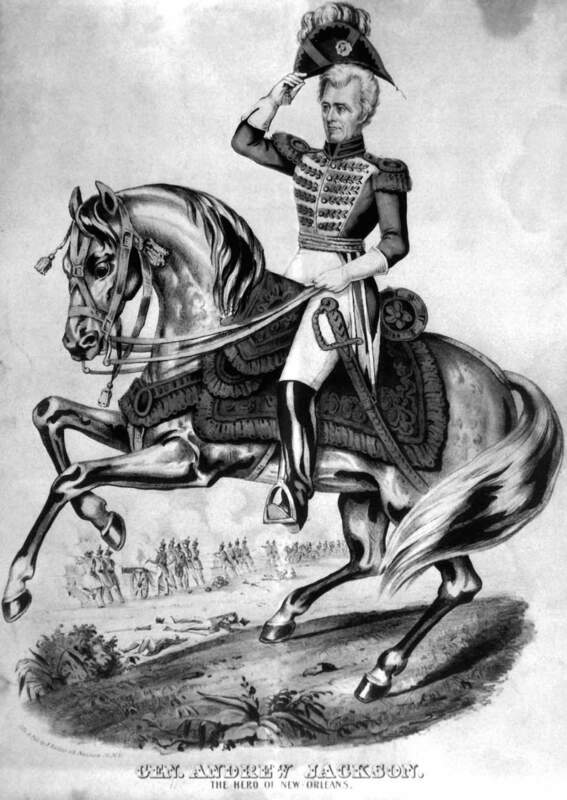 149k Gen. Andrew Jackson. The Hero of New Orleans. 1815. Copy of lithograph by James Baillie, ca. 1840s. NARA FILE #: 208-PR-10P-2 Official USN photo # HD-SN-99-01753, from the Department of Defense Still Media Collection, courtesy of dodmedia.osd.mil. 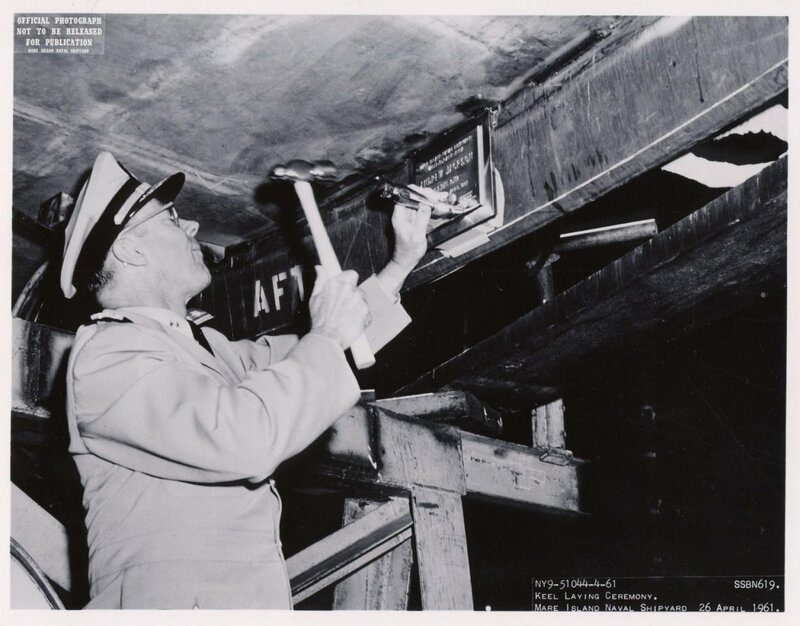 712k RADM L. V. Honsinger, USN, Shipyard Commander is at the speaker’s stand during the keel laying of the Andrew Jackson (SSBN-619) at Mare Island on 26 April 1961. Honorary “keel layers” are standing on the right and are Russell P. Tye, Plant and Utilities Group; Joseph S. Ronan, Master Electrician; Charles J. O’Donnell, Chief Planner and Estimator; and John A. Dahlgren, Supervisor Material Division, Supply Department. USN photo # 51043-4-61, contributed by Darryl L. Baker. 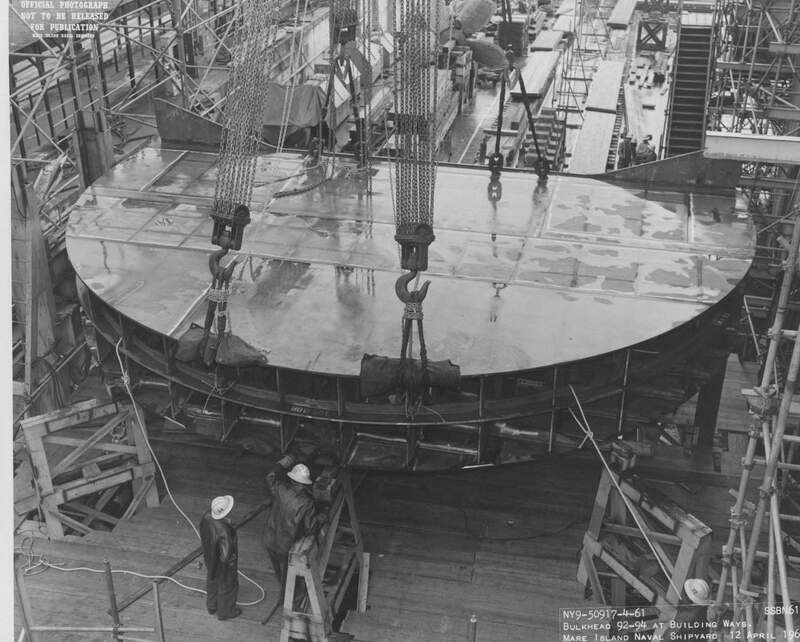 775k Ship’s patch at the time of her keel laying at Mare Island. USN photo # 54752-4-61, contributed by Darryl L. Baker. 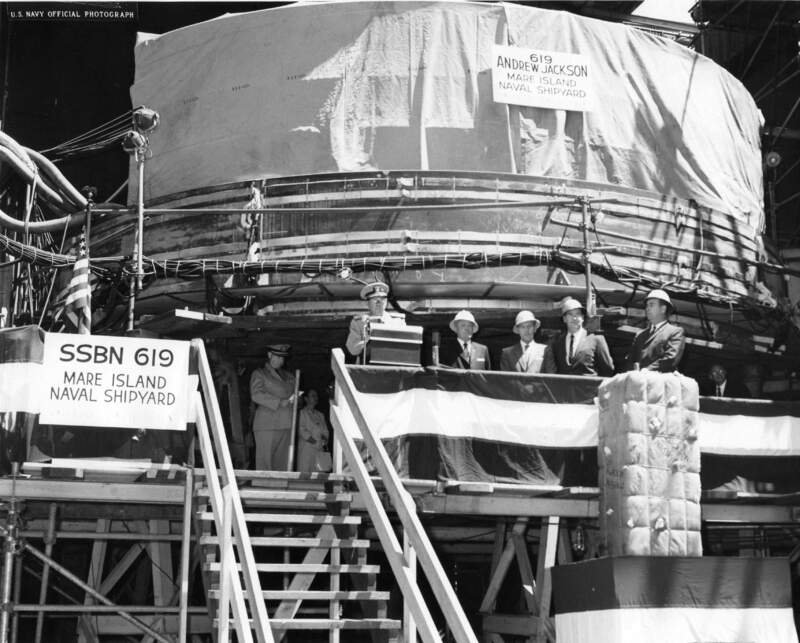 186k RADM L. V. Honsinger, USN authenticates the keel of the Andrew Jackson (SSBN-619) at Mare Island Naval Shipyard on 26 April 1961. 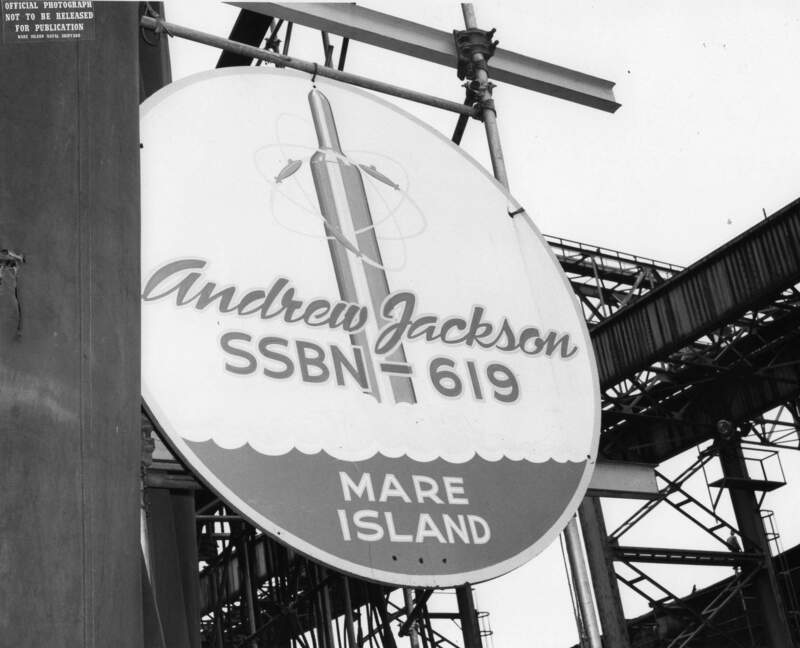 The Andrew Jackson is the shipyard's second Fleet Ballistic Submarine and her 8th nuclear powered submarine. USN photo # NY9-51044-4-61, contributed by Darryl L. Baker. 884k This is a clipping from Mare Island Naval Shipyard's newspaper Grapevine 28 April 1961 edition. 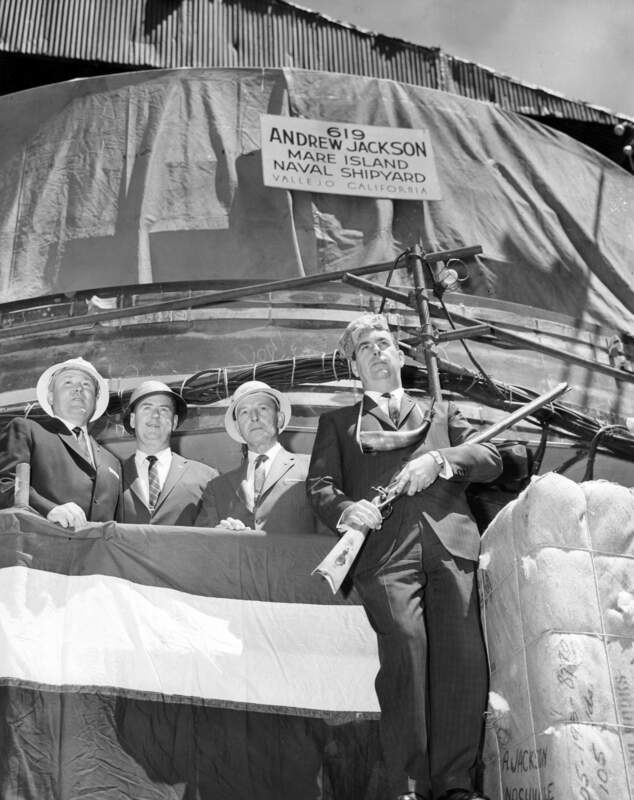 The pictures caption read: "Russell Tye, Master of Plant Utilities Shops, reenacted the Battle of New Orleans with a bale of cotton and his trusty squirrel gun in honor of old 'Andy' Jackson at the keel laying of the Polaris submarine Andrew Jackson (SSBN-619), named for the seventh president. Other honorary keel-layers were (left to right) Joseph S. Ronan, Master Electrician; Charles J. O'Donnell, Chief Planner and Estimator; and John A. Dahlgren, Supervisor Material Division, Supply Department." Vallejo Naval and Historical Museum photo # 51042-4-61 TH contributed by Darryl L. Baker. 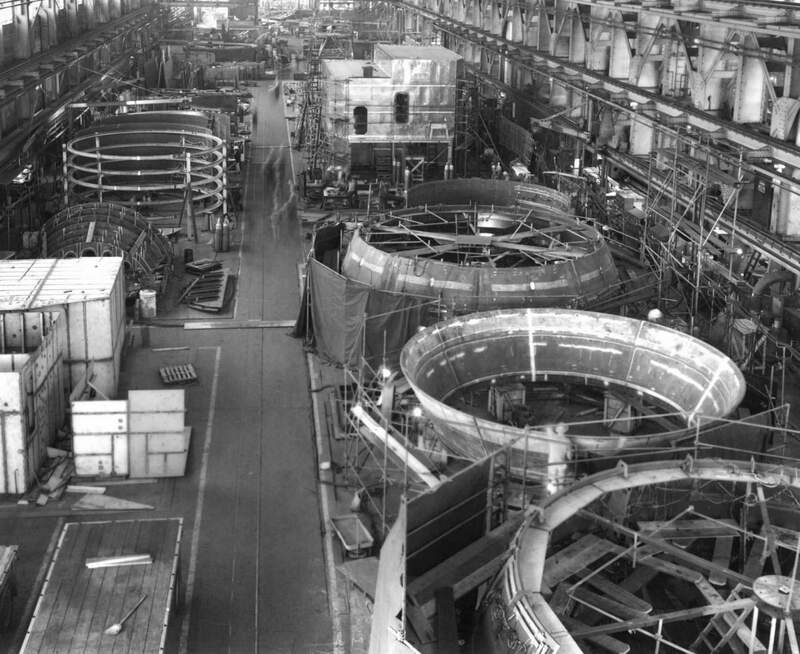 311k This photo dated April 1961, shows hull sections of Fleet Ballastic Submarine Andrew Jackson (SSBN-619) being fabricated in Shop 11 (Shipfitters) at Mare Island Naval Shipyard. Deck houses in the background are for FRAM working underway at the shipyard on several destroyers. USN photo # 50936-4-61, contributed by Darryl L. Baker. 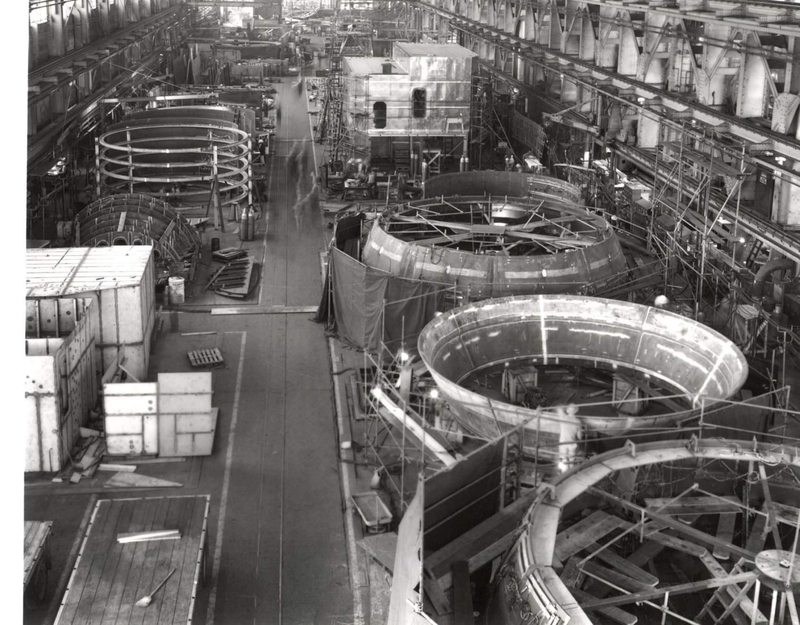 339k This photo dated April 1961, shows hull sections of Fleet Ballastic Submarine Andrew Jackson (SSBN-619) being fabricated in Shop 11 (Shipfitters) at Mare Island Naval Shipyard. USN photo courtesy of Scott Koen & ussnewyork.com. 131k Hull section 11 being transported from the southern hull fabrication area to the building ways. 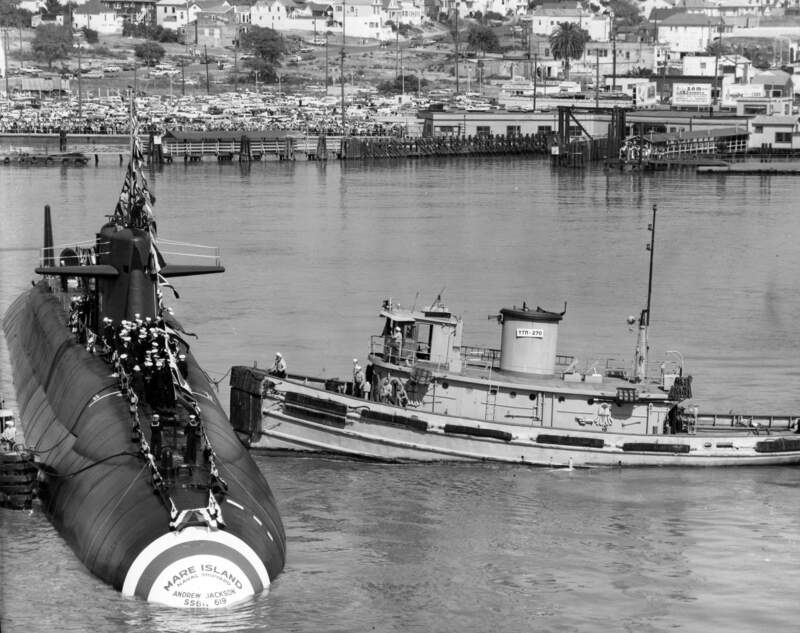 This section is for the Andrew Jackson (SSBN-619) at Mare Island Naval SHipyard on 10 June 1961. USN photo # NY9-51682-6-61, contributed by Darryl L. Baker. 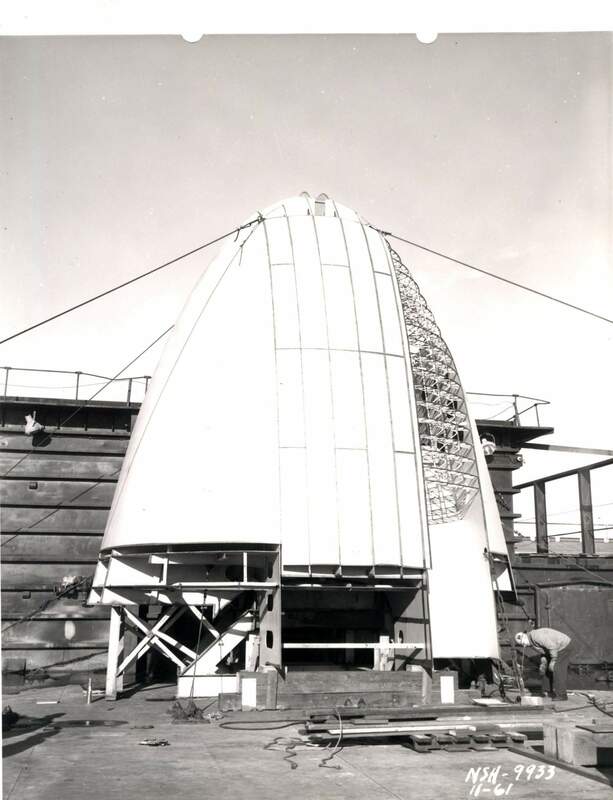 196k Bulkhead 92-94 of the Andrew Jackson (SSBN-619) is being rasied on the building ways at Mare Island Naval Shipyard on 12 April 1961. USN photo # NY9-50917-4/61, contributed by Darryl L. Baker. 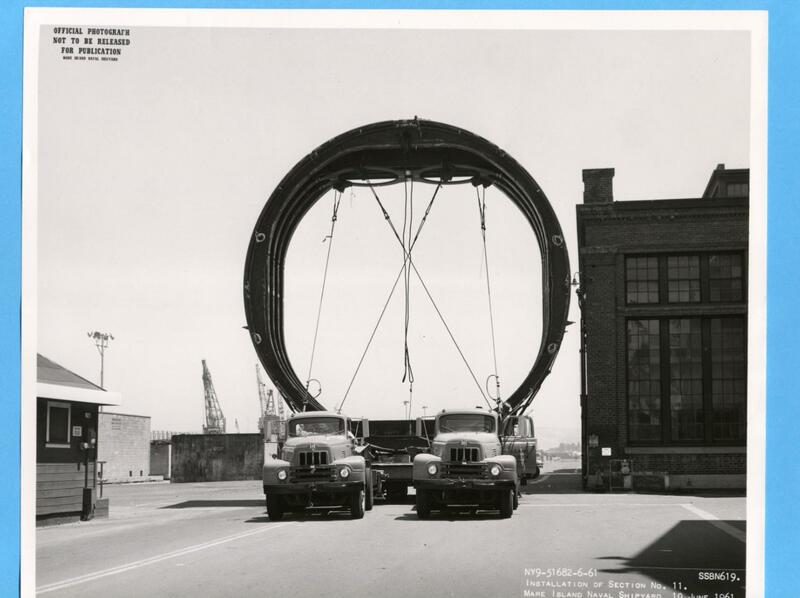 199k The bow section of Andrew Jackson (SSBN-619) is being loaded at Puget Sound Naval Shipyard for shipment to Mare Island Naval Shipyard in November 1961. USN photo # NSH-9933, contributed by Darryl L. Baker. 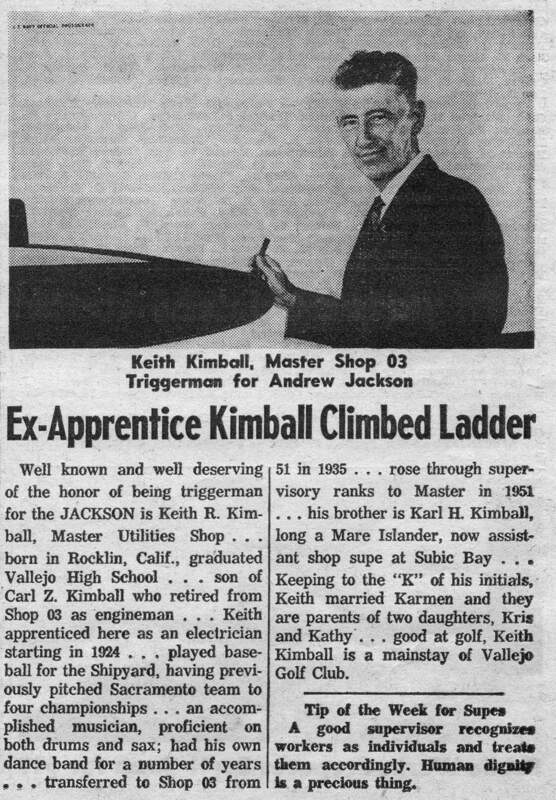 447k Article on the Andrew Jackson's (SSBN-619) triggerman, Mr. Kimball, from the 14 June 1962 edition of the yard’s newspaper, the Grapevine. USN Photo courtesy of Darryl L. Baker. 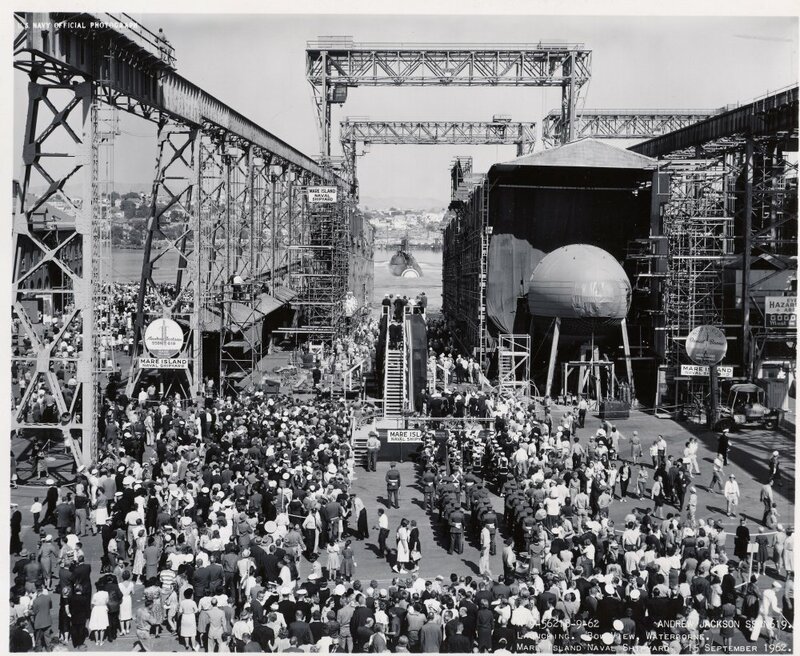 922k General view of the launching study for the launching of Andrew Jackson (SSBN-619) conducted at Mare Island on 22 August 1962. Vallejo Naval & Historical Museum photo courtesy of Darryl L. Baker. 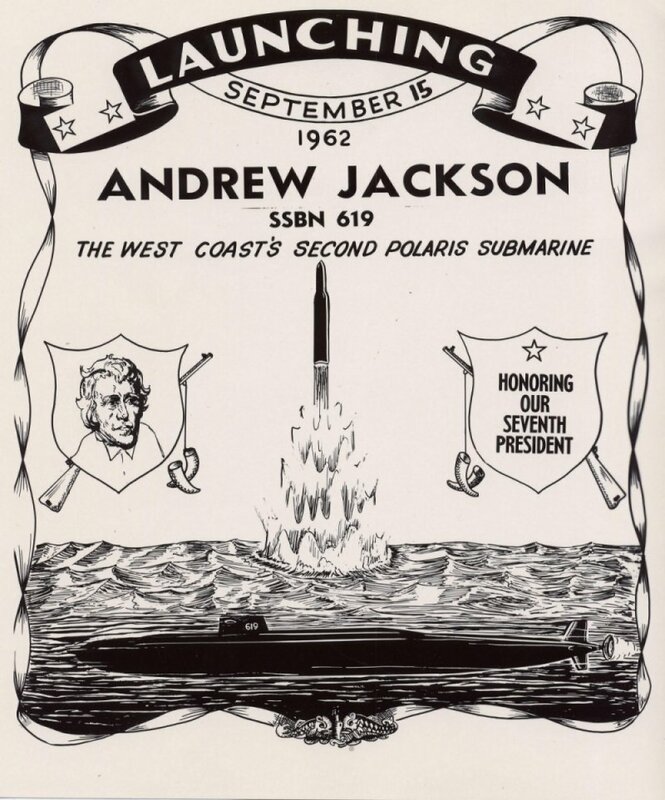 152k This is the photo ready art work for the front page of the 14 September 1962 edition of Mare Island Naval Shipyard's newspaper Grapevine marking the launching of the Andrew Jackson (SSBN-619). USN photo contributed by Darryl L. Baker. 274k 3 photo PDF showing the silver trigger key of the Andrew Jackson (SSBN-619) which is engraved with the name of Keith Kimball, Master of the Power Plant at Mare Island, for many years. Photo contributed by Kathy Kimball. 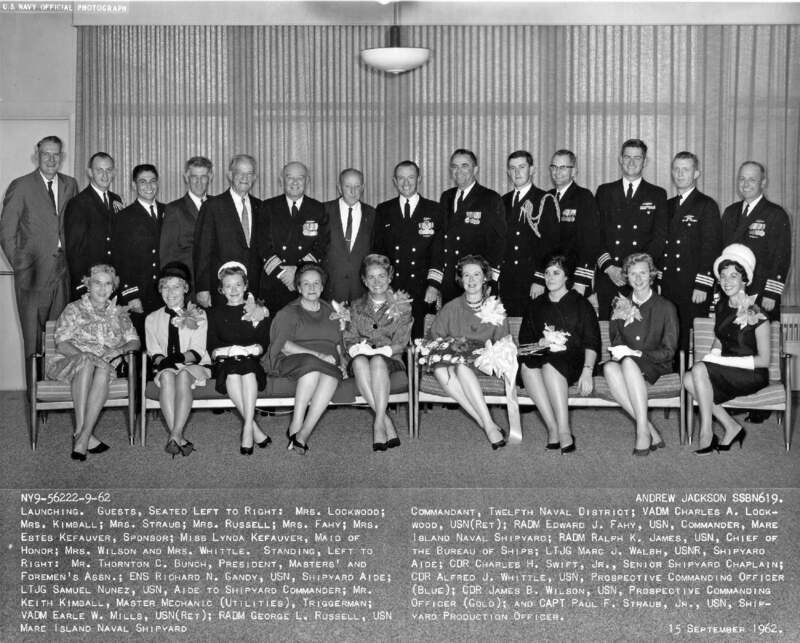 478k Group photo of the VIPs at the launching of the Andrew Jackson (SSBN-619) at Mare Island on 15 September 1962: Seated left to right; Mrs. Lookwood; Mrs. Kimball; Mrs. Straub; Mrs. Russell; Mrs. Fahy; Mrs. Estes Kefauver, Sponsor; Miss Lynda Kefauver, Maid of Honor; Mrs. Wilson and Mrs. Whittle. Standing, left to right: Mr. Thornton C. Bunch, President, Masters’ and Foremen’s Assn. ; ENS Richard N. Gandy, USN, Shipyard Aide; LTJG Samuel Nunez, USN, Aide to Shipyard Commander; Mr. Keith Kimball, Master Mechanic (Utilities), Triggerman; VADM Earle W. Mills, USN (Retired); RADM George L. Russell, USN, Commandant, Twelfth Naval District; VADM Charles A. Lookwood, USN (Retired); RADM Edward J. Fahy, USN, Commander, Mare Island Naval Shipyard; RADM Ralph K. James, USN, Chief of the Bureau of Ships; LTJG Marc J. Walsh, USNR Shipyard Aide; CDR Charles H. Swift, Jr., Senior Shipyard Chaplain; CDR Alfred J. Whittle, USN, Prospective Commanding Officer (Blue); CDR James B. Wilson, USN Prospective Commanding Officer (Gold); and Capt Paul F. Straub, Jr., USN, Shipyard Production Officer. USN Photo # 56222-9-62, courtesy of Darryl L. Baker. 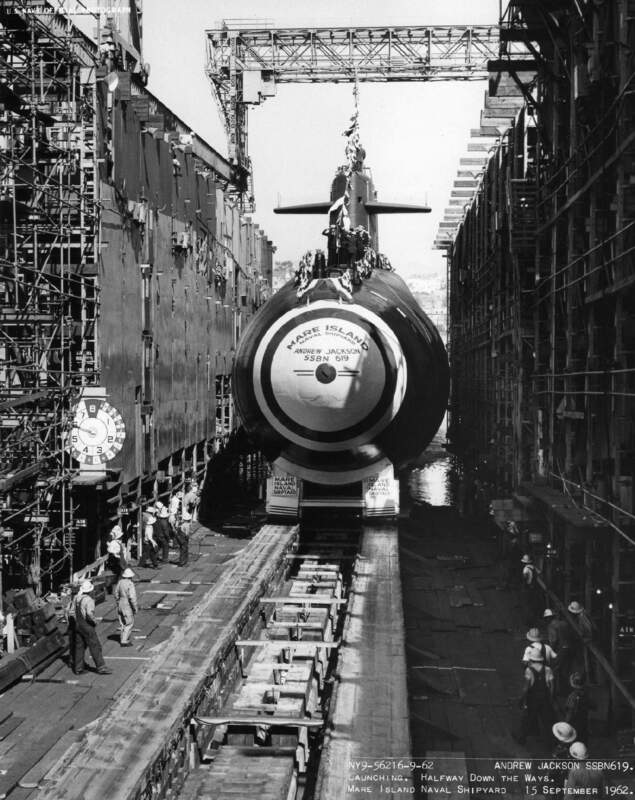 226k Bow view of the Andrew Jackson (SSBN-619) just prior to its launching at Mare Island Naval Shipyard on 15 September 1962. 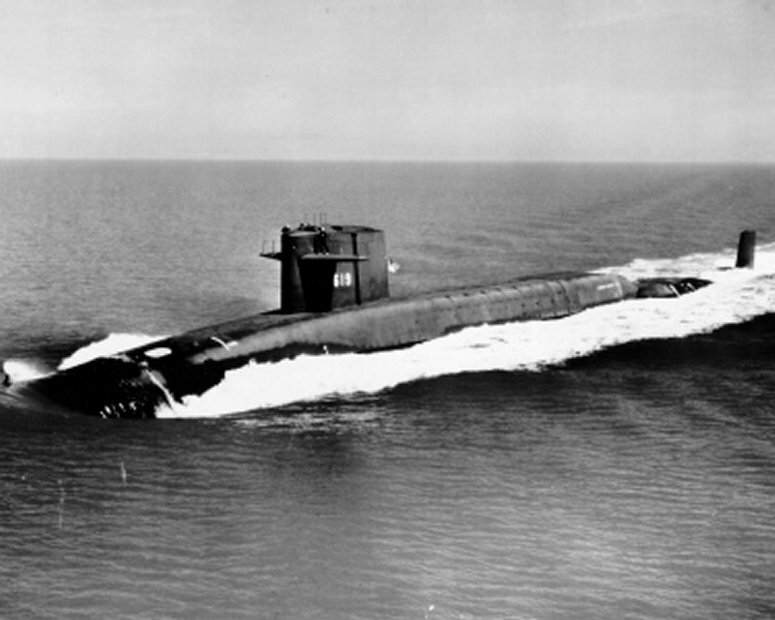 The bow of the Daniel Boone (SSBN-629) is visible to the right. USN photo # NY9-56201-9-62, contributed by Darryl L. Baker. 271k Elevated bow view of the Andrew Jackson (SSBN-619) at Mare Island on building ways One North on 15 September 1962. USN photo # NY9-56202-9-62, contributed by Darryl L. Baker. 176k Photo of the official launching party of the Andrew Jackson (SSBN-619) at Mare Island on 15 September 1962. 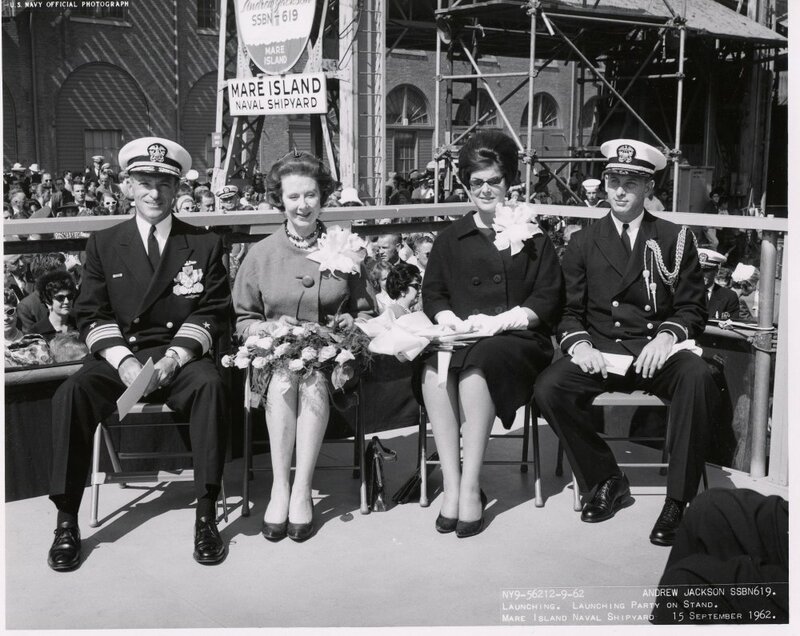 Left to Right: RADM Edward J. Fahy, USN, Commander, Mare Island Naval Shipyard; Mrs. Estes Kefauver, Sponsor; Miss. Lynda Kefauver, Maid of Honor, and ENS Richard N. Gandy, USN, Shipyard Aide. USN photo # NY9-56212-9-62, contributed by Darryl L. Baker. 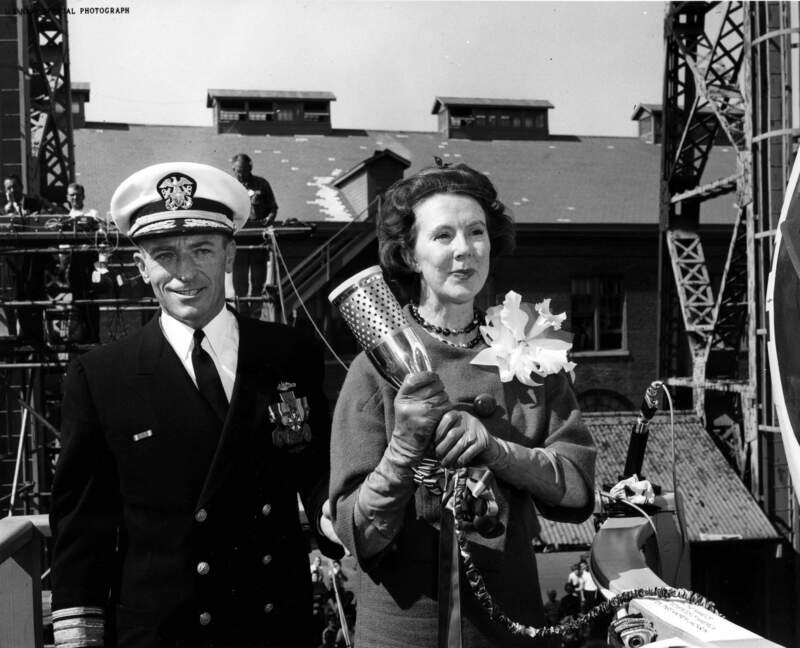 884k RADM Edward J. Fahy, USN, Shipyard Commander stands ready to assist Mrs. Estes Kefauver, Sponsor to christen the Andrew Jackson (SSBN-619) at Mare Island on 15 September 1962. USN photo # 56230-9-62, contributed by Darryl L. Baker. 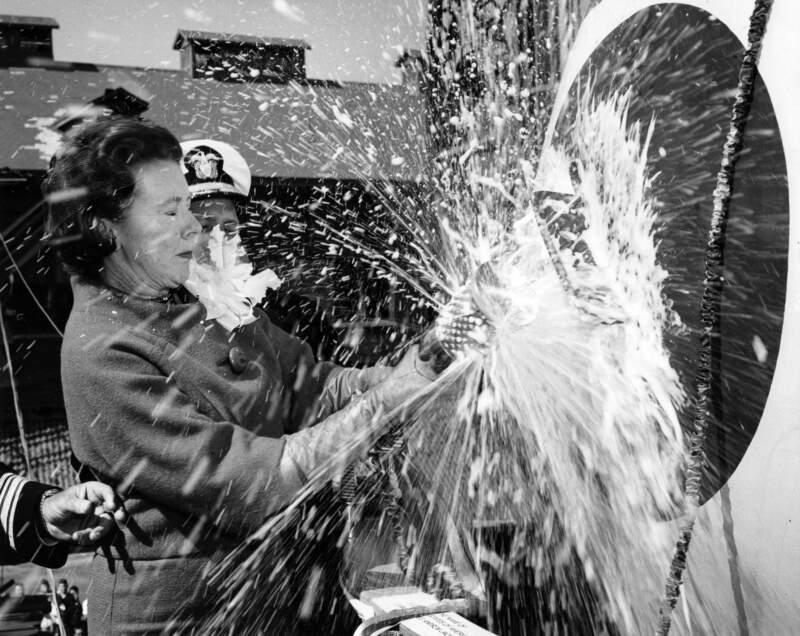 2.90k Mrs. Estes Kefauver christens the Andrew Jackson (SSBN-619) at Mare Island on 15 September 1962. USN photo # 56214-9-62, contributed by Darryl L. Baker. 276k Mrs. Estes Kefauver, Sponsor, christening the Andrew Jackson (SSBN-619) at Mare Island Naval Shipyard on 15 September 1962. USN photo # NY9-56215-9-62, contributed by Darryl L. Baker. 987k The Andrew Jackson (SSBN-619) is at the end of the building ways at Mare Island on 15 September 1962. USN photo # 56219-9-62, contributed by Darryl L. Baker. 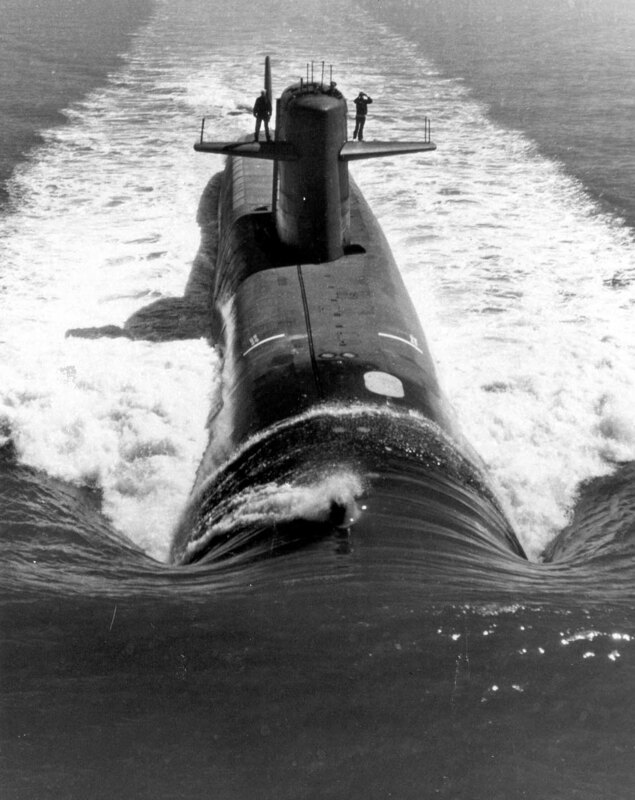 608k Stern view of Andrew Jackson (SSBN-619) just entering the water during her launching on 15 September 1962. Vallejo Naval and Historical Museum photo # 56218C-4-62 TH contributed by Darryl L. Baker. 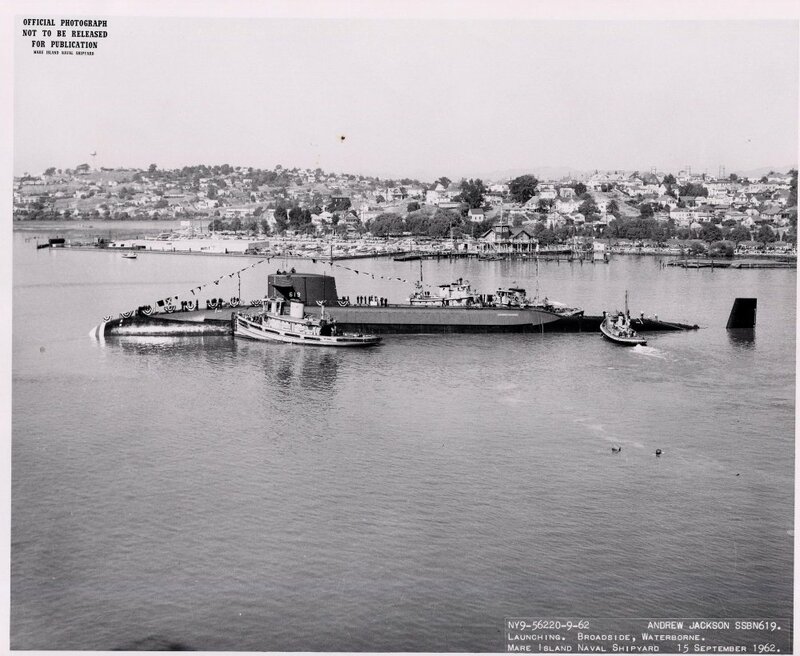 283k Andrew Jackson (SSBN-619) is waterborne for the first time after launching at Mare Island Naval Shipyard on 15 September 1962. USN photo # NY9-56218-9-62, contributed by Darryl L. Baker. 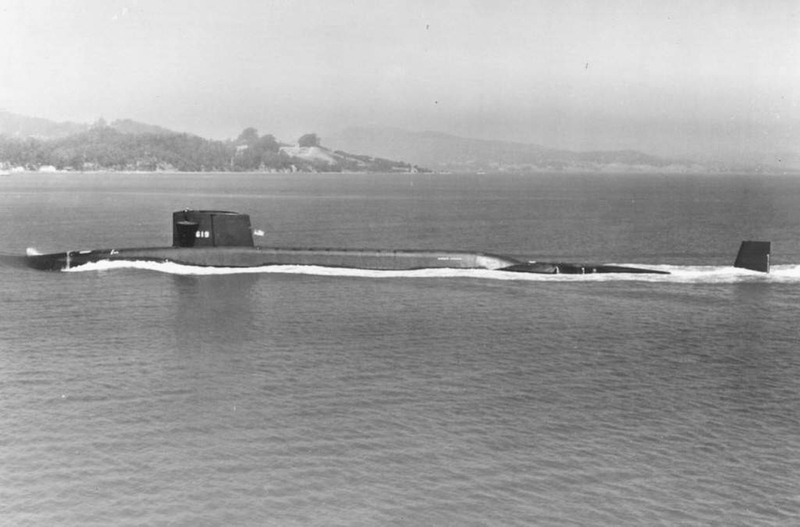 530k Stern view of Andrew Jackson (SSBN-619) afloat for the first time at Mare Island on 15 September 1962. Vallejo Naval and Historical Museum photo # 56218D-4-62 TH contributed by Darryl L. Baker. 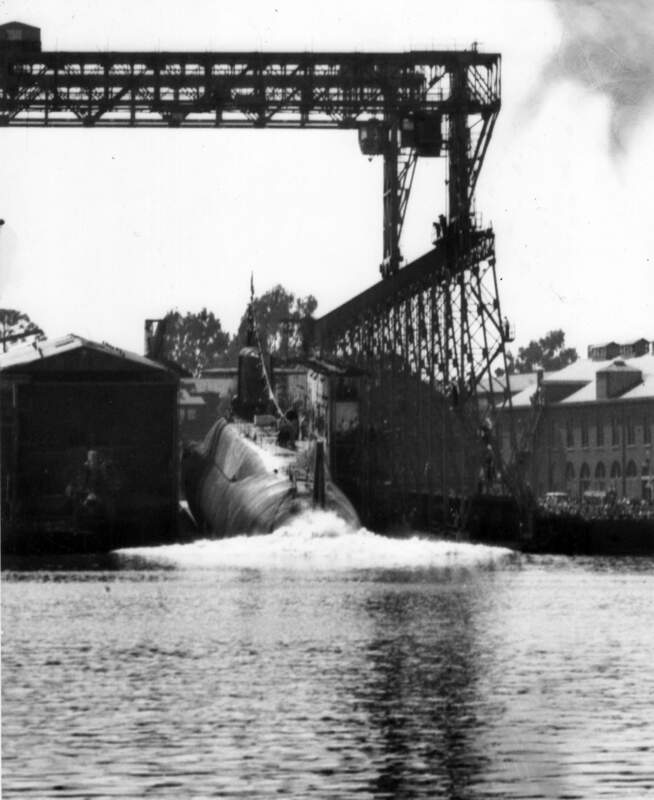 243k Andrew Jackson (SSBN-619) is shown entering the water from the building ways at Mare Island Naval Shipyard on 15 September 1962. USN photo # NY9-56290-9-62, contributed by Darryl L. Baker. 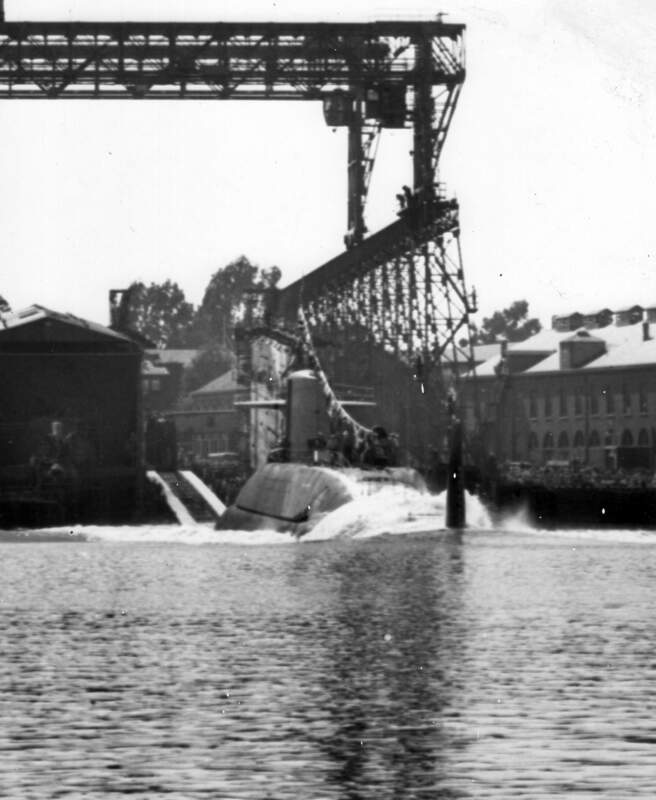 303k Andrew Jackson's (SSBN-619) crew holding on to their salute as the boat enters the water from the building ways at Mare Island Naval Shipyard on 15 September 1962. USN photo # NPC 1062709 courtesy of Scott Koen & ussnewyork.com. 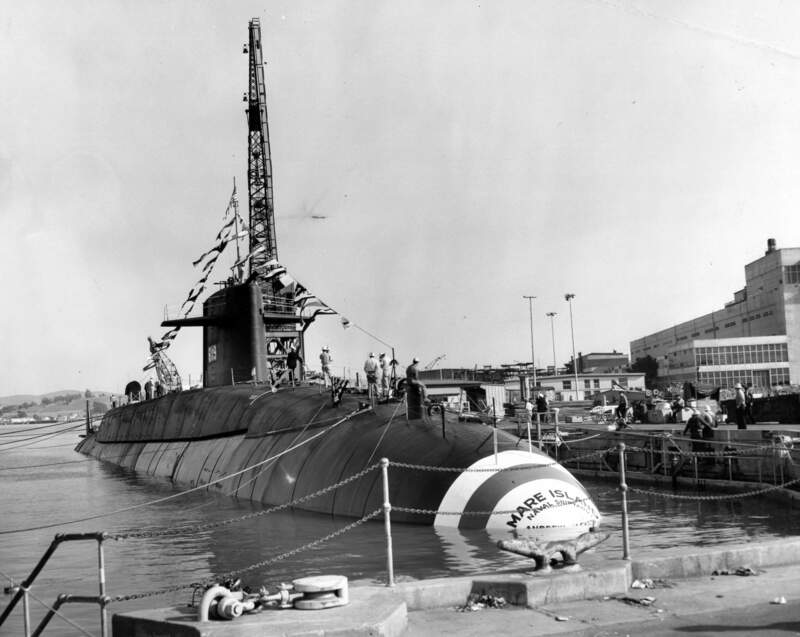 7 167k Broadside view of the Andrew Jackson (SSBN-619) after her launching at Mare Island Naval Shipyard on 15 September 1962. USN photo # NY9-56220-9-62, contributed by Darryl L. Baker. 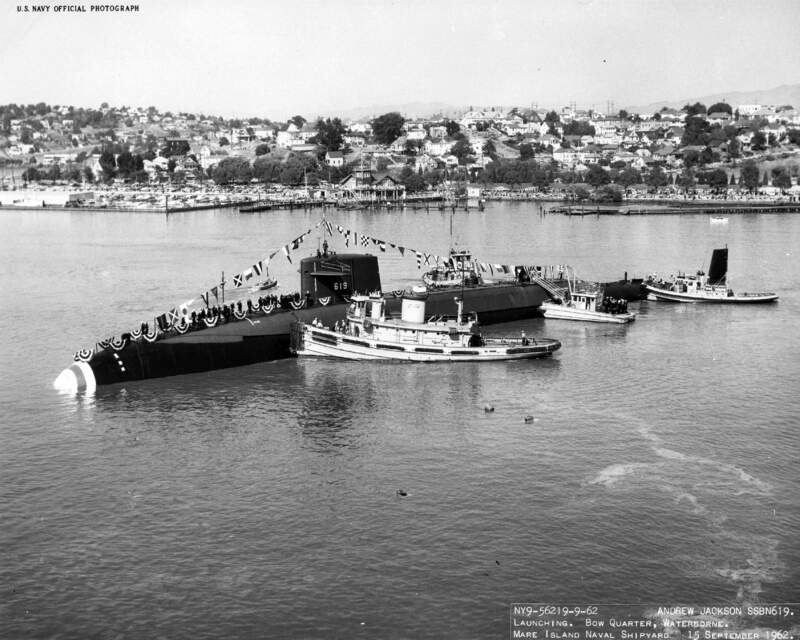 987k Tugs are alongside to get the Andrew Jackson (SSBN-619) into dry dock #2 to drop her launching cradle at Mare Island on 15 September 1962. Tugs are on port side are left to right: Satanta (YTM-270), Sea Mule (YTL-614) is removing ship riders and YTL-435. The tug on the starboard side could be Lelaka (YTB-514). 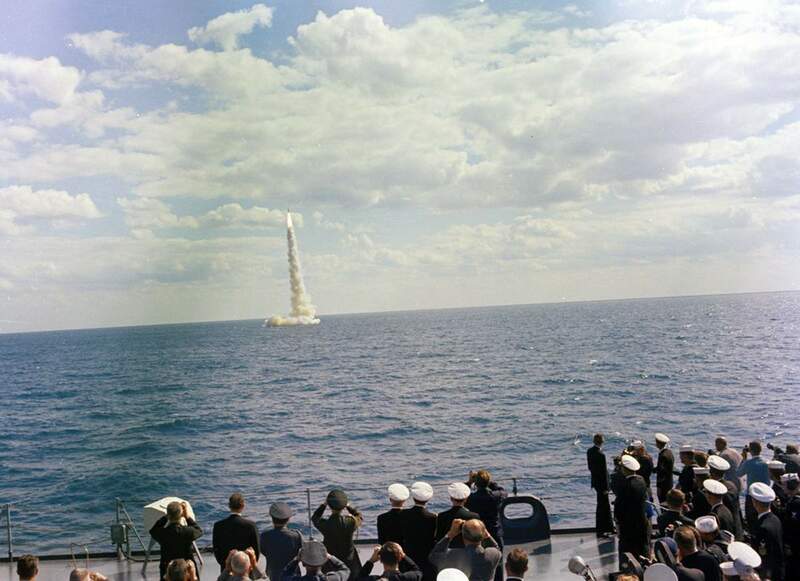 USN photo # 56219-9-62, contributed by Darryl L. Baker. 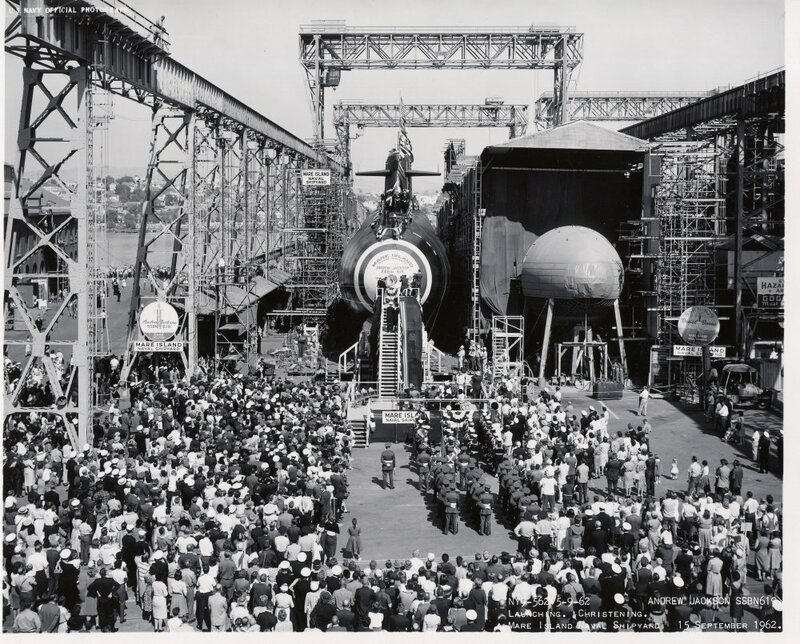 1.10k The tug Satanta (YTM-270) is preparing to move the new launched Andrew Jackson (SSBN-619) to dry dock #3 after her launching at Mare Island on 15 September 1962. Vallejo Naval and Historical Museum photo # 56218C-9-62TH contributed by Darryl L. Baker. 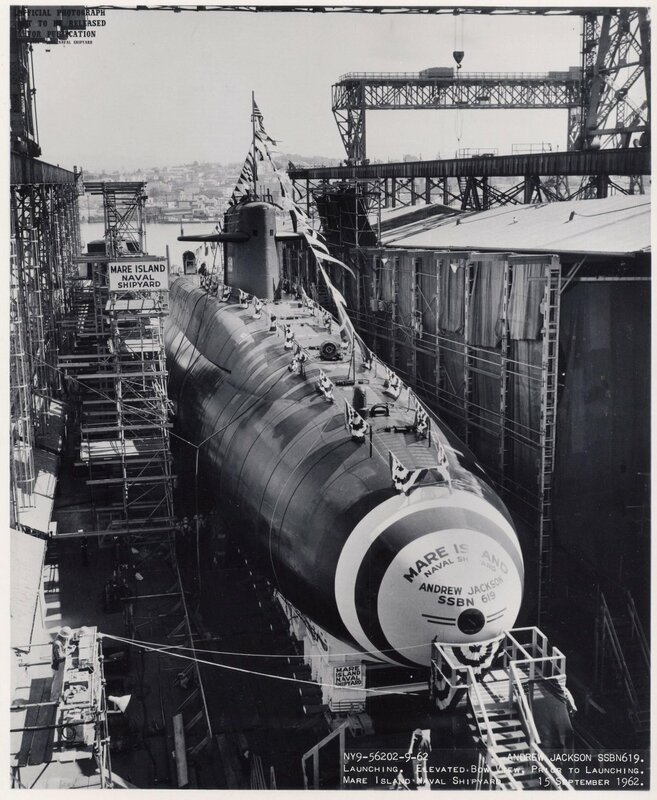 824k Andrew Jackson (SSBN-619) in Mare Island's dry dock #3 after launching on 15 September 1962. Vallejo Naval and Historical Museum photo # 56223-9-62 TH contributed by Darryl L. Baker. 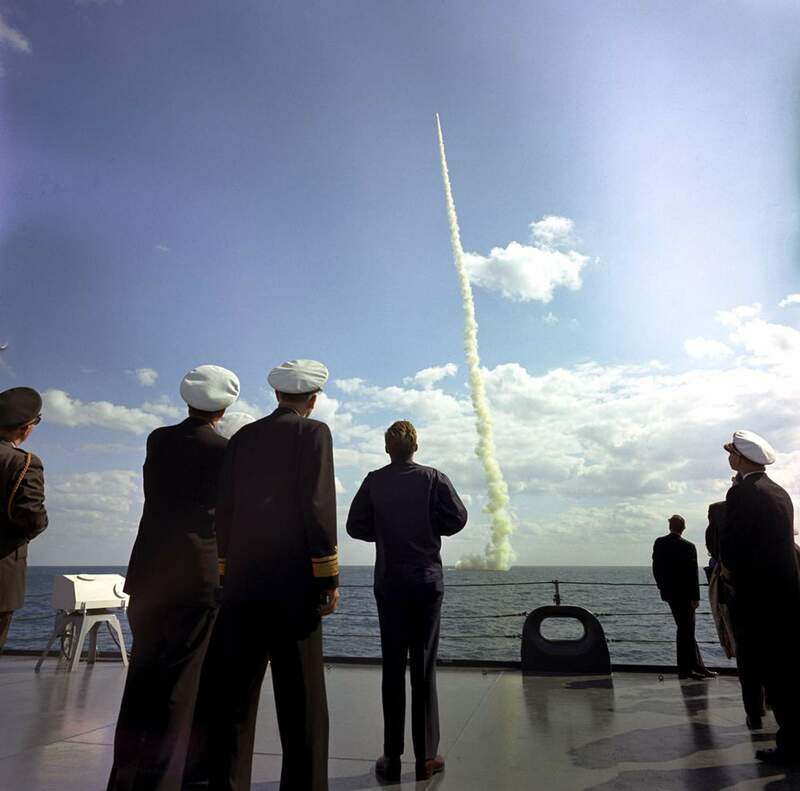 332k Launching program for the Andrew Jackson (SSBN-619) on 15 September 1962. Photo courtesy of Dale Hargrave. 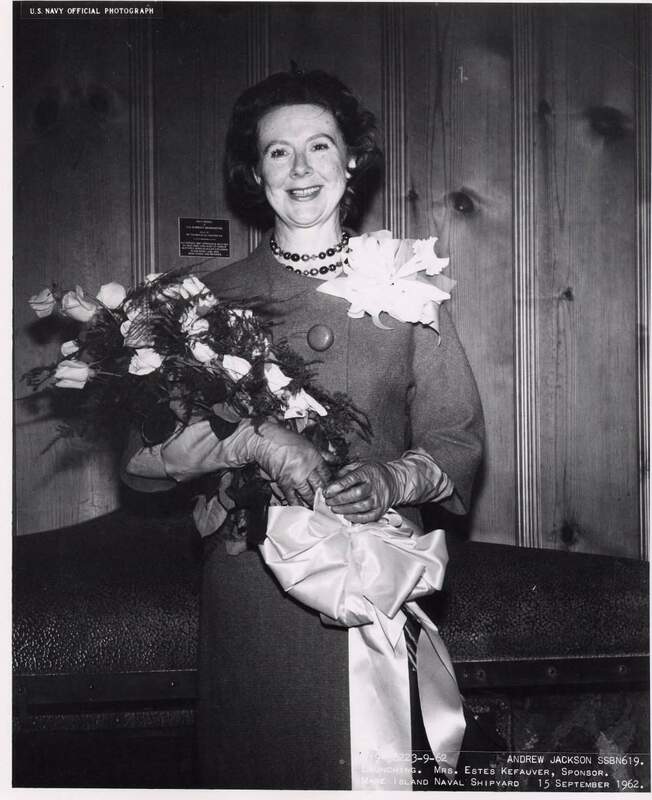 128k Photo of Mrs. Estes Kefauver, Sponsor of the Andrew Jackson (SSBN-619) at the reception following the launching at Mare Island Naval Shipyard on 15 September 1962. USN photo # NY9-56223-9-62, contributed by Darryl L. Baker. 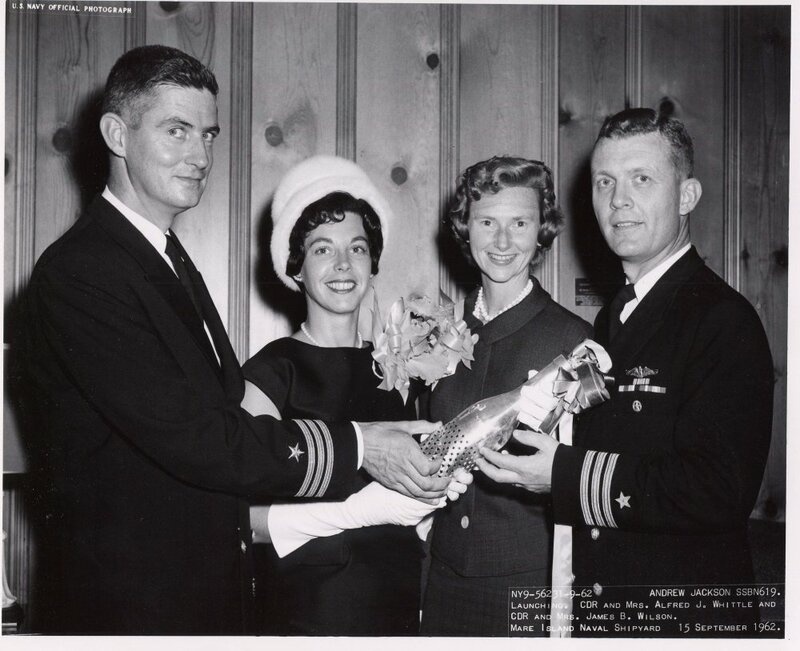 135k Photo of CDR & wife; Mrs. Alfred J. Whittle, USN, PCO of Andrew Jackson (SSBN-619) (Blue Crew) and CDR & wife; Mrs. James B. Wilson, USN, PCO of Andrew Jackson (Gold Crew) at a reception at Mare Island Naval Shipyard following the launching of the ship on 15 September 1962. USN photo # NY9-56231-9-62, contributed by Darryl L. Baker. 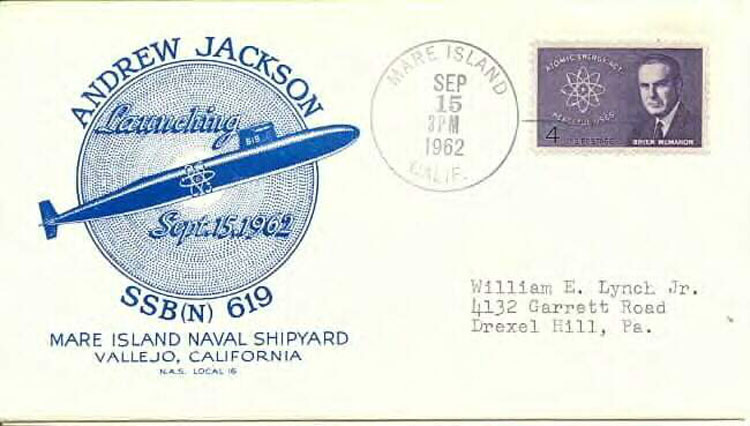 79k Commemorative post mark on the occasion of the launching of the Andrew Jackson (SSBN-619) on 15 September 1962. USN photo courtesy of Scott Koen & ussnewyork.com. 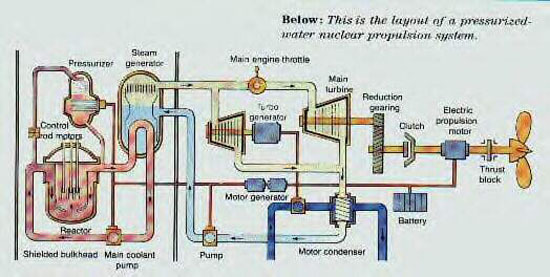 66k Layout of a pressurized water nuclear propulsion system such as appeared aboard the Andrew Jackson (SSBN-619). USN photo courtesy of Scott Koen & ussnewyork.com. 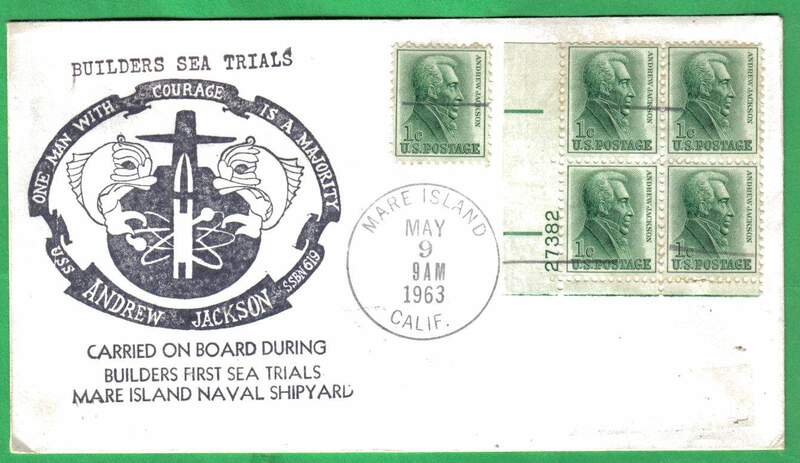 143k Commemorative post mark on the occasion of the Andrew Jackson's (SSBN-619) first sea trials, 9 May 1963. Courtesy of Jack Treutle (of blessed memory). 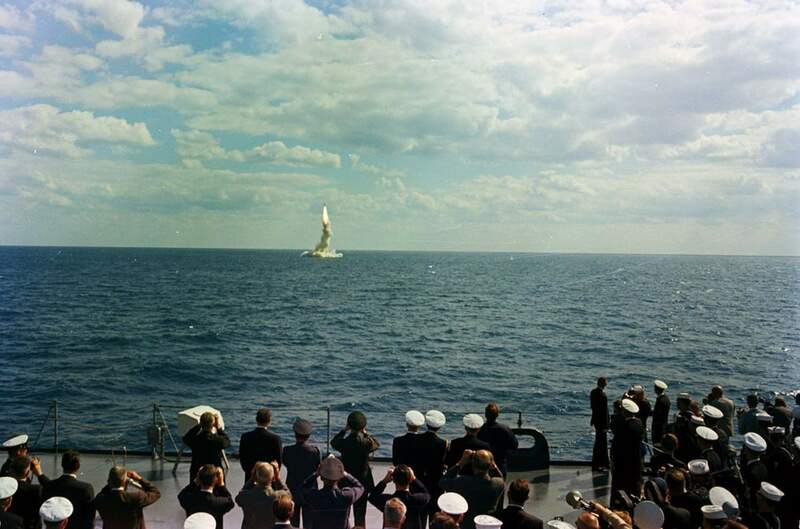 380k The fourth of June 1963 found the crew of the Andrew Jackson (SSBN-619) during a series of Photo for her trials. USN photo # NPC 1095035 courtesy of Scott Koen & ussnewyork.com. 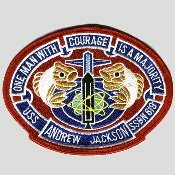 137k The trials of Andrew Jackson (SSBN-619). USN photo courtesy of pelicanharborsubvets.com. 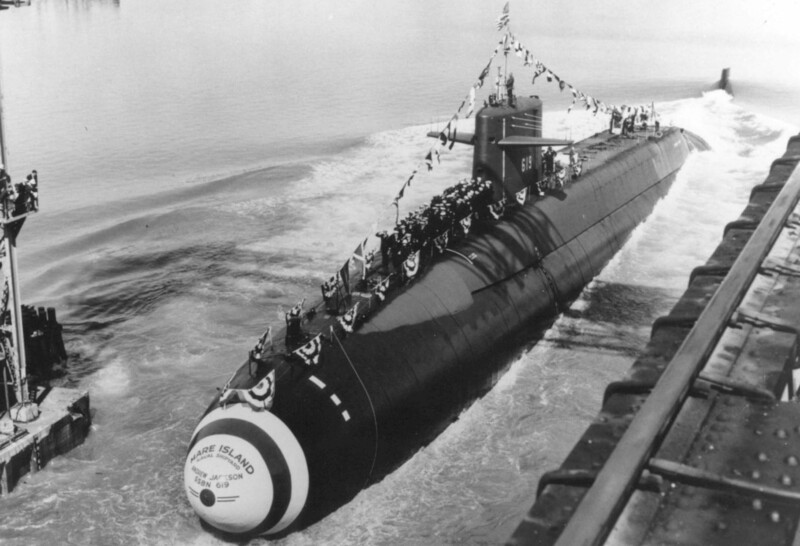 266k The Andrew Jackson (SSBN-619) had easier trials as a submarine than he did as a President. USN photo courtesy of Scott Koen & ussnewyork.com. 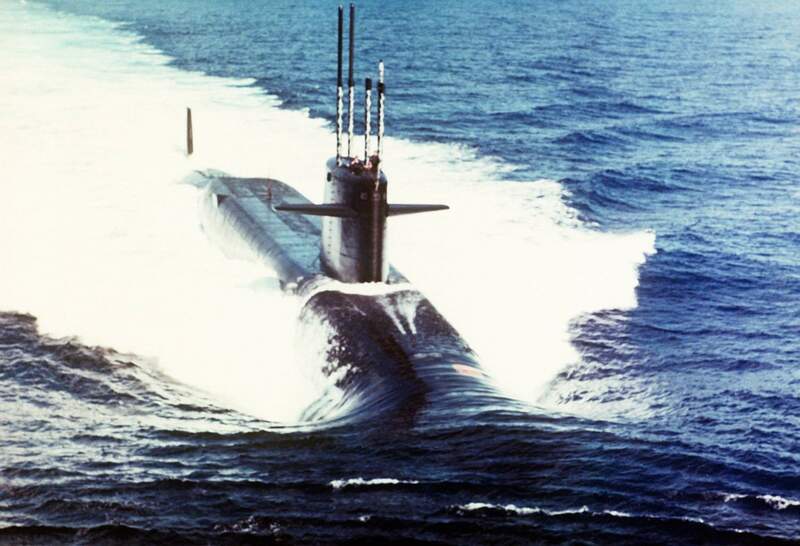 64k Andrew Jackson (SSBN-619), the 13th and newest nuclear powered fleet ballistic missile submarine to be commissioined, will join the fleet 3 July 1963. USN photo contributed by Darryl L. Baker. 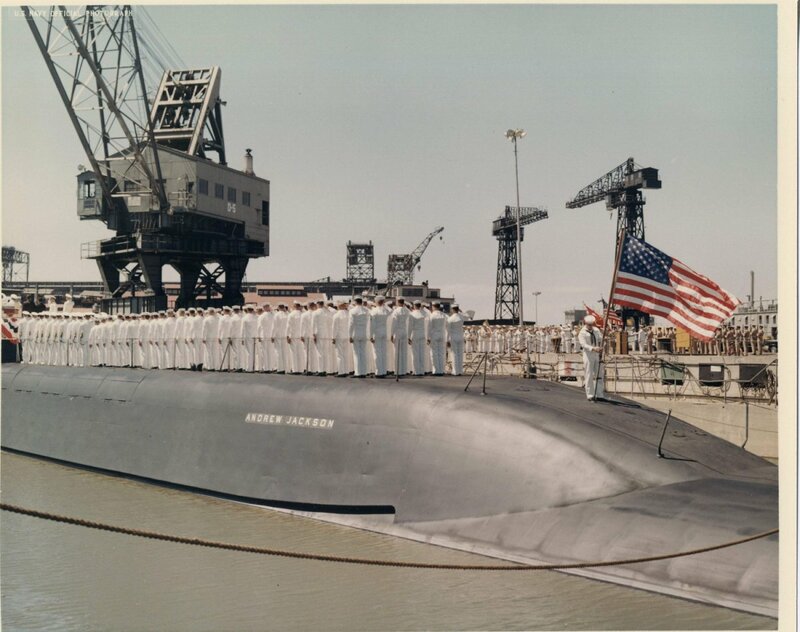 171k Colors are raised for the first time aboard Andrew Jackson (SSBN-619) during her commissioning at Mare Island Naval Shipyard on 3 July 1963. She is seen in dry dock 3. USN photo # MSA 59898-7-63, contributed by Darryl L. Baker. 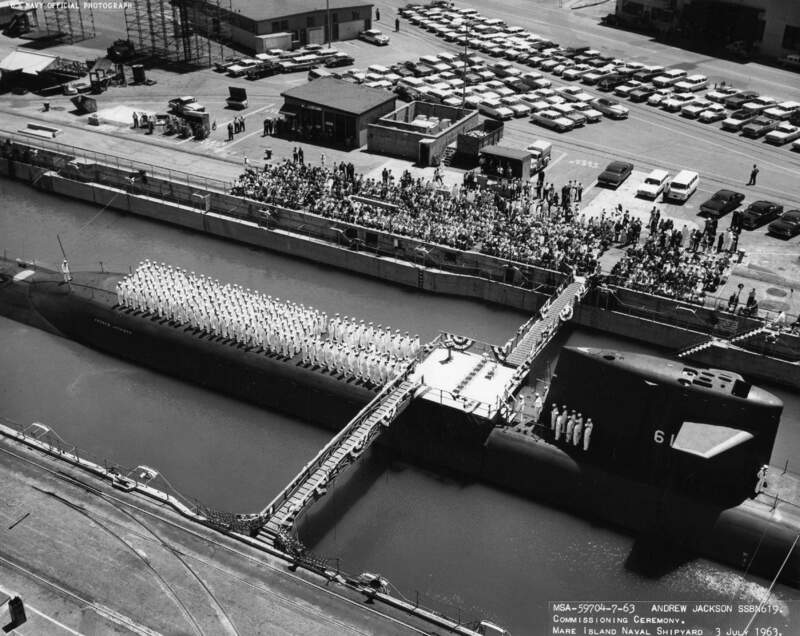 899k View of the commissioning ceremonies of the Andrew Jackson (SSBN-619) in dry dock #2 at Mare Island on 3 July 1963. USN photo # 59704-7-63, contributed by Darryl L. Baker. 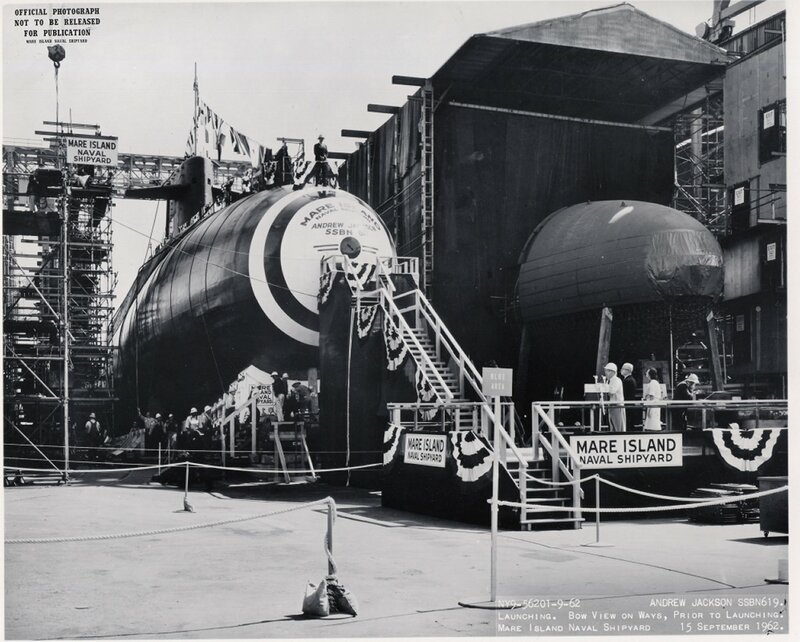 175k Bow view of the Andrew Jackson (SSBN-619) at Mare Island during her commissioning in dry dock 3 on 3 July 1963. USN photo # MSA 59897-7-63, contributed by Darryl L. Baker. 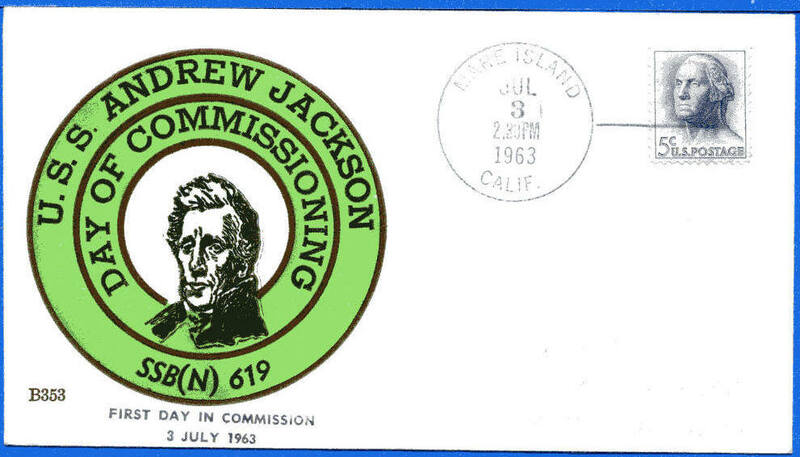 94k Commemorative post mark on the occasion of the commissioning of the Andrew Jackson (SSBN-619), 3 July 1963. Courtesy of Jack Treutle (of blessed memory). 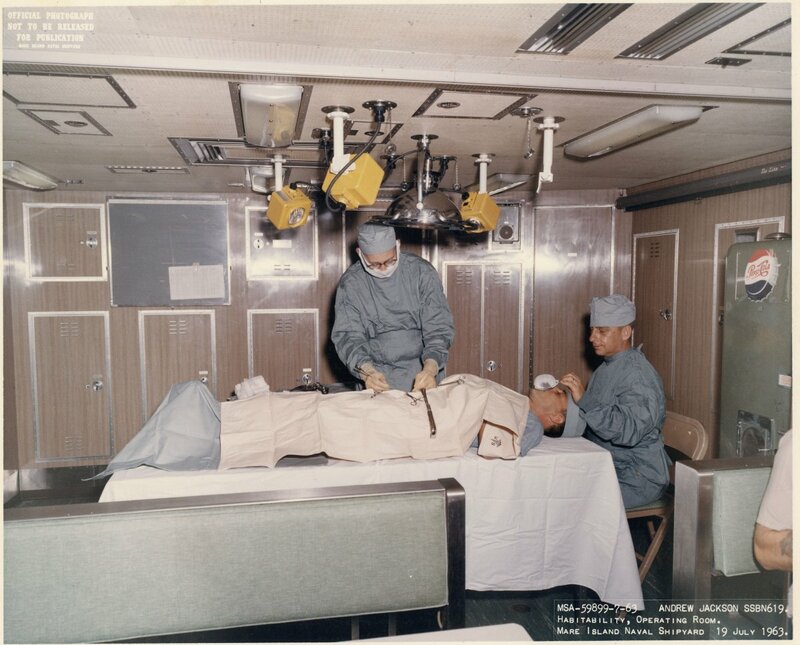 200k Pictures shows the crews mess aboard the Andrew Jackson (SSBN-619) configured as an operating room. 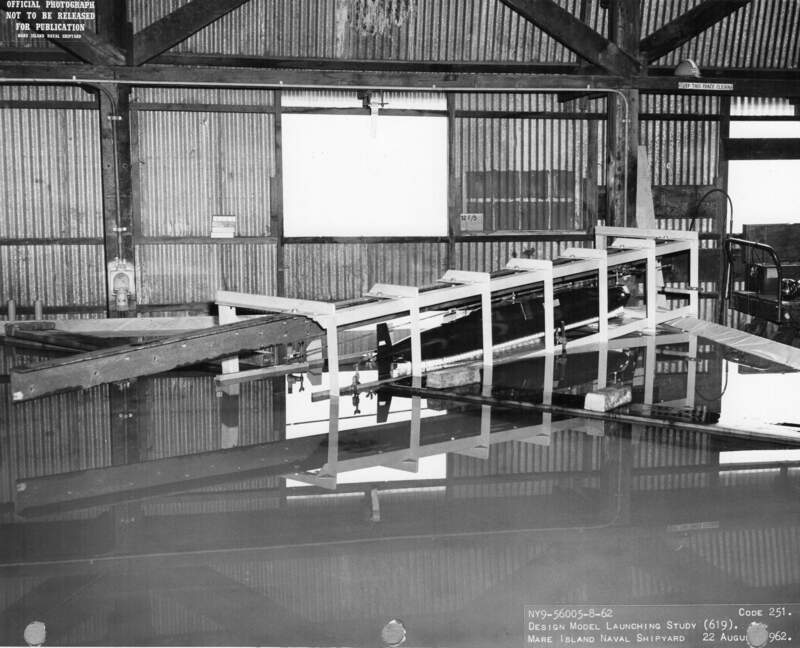 Picture taken at Mare Island Naval Shipyard on 19 July 1963. USN photo # MSA 59899-7-63, contributed by Darryl L. Baker. 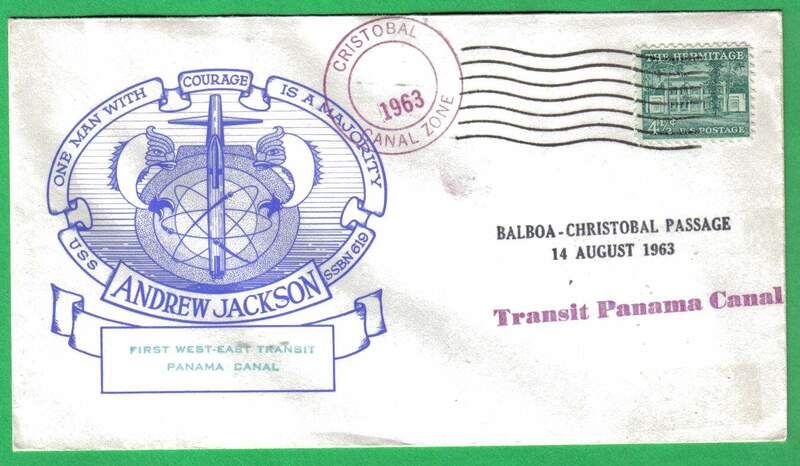 152k Commemorative post mark on the occasion of the Andrew Jackson's (SSBN-619) East - West Panama Canal Transit, 14 August 1963. Courtesy of Jack Treutle (of blessed memory). 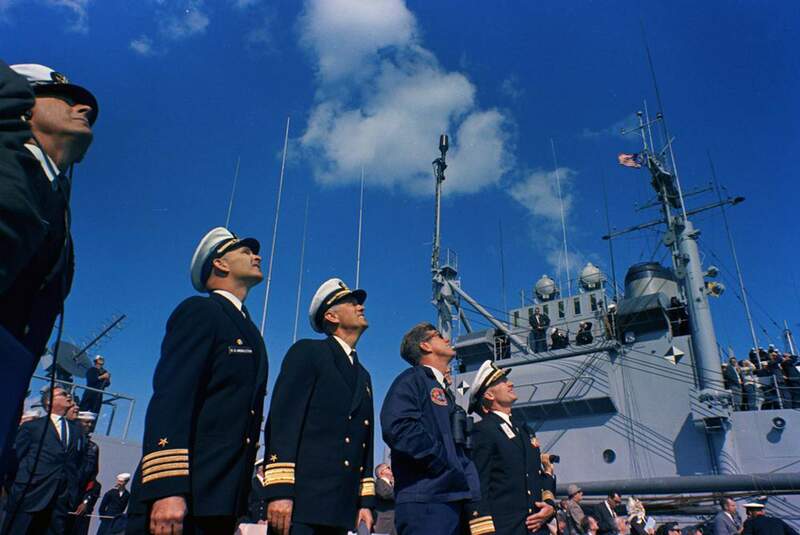 699k During a visit aboard the United States Naval ship Observation Island (E-AG-154), President John F. Kennedy (center right, wearing sunglasses) watches a demonstration of the firing of a Polaris A-2 missile from the submarine Andrew Jackson (SSBN-619), at sea off the coast of Florida. Left to right: unidentified military officer (partially hidden on edge of frame); White House Secret Service agent, Floyd Boring (in back); Commanding Officer of the Observation Island, Captain Roderick O. Middleton; Deputy Commander of the Submarine Force of the U.S. Atlantic Fleet, Rear Admiral Vernon L. Lowrance; President Kennedy (wearing a windbreaker bearing the insignias of Observation Island and Andrew Jackson presented as a gift from the crews of both ships); and Director of Special Projects (USN), Rear Admiral I. J. Galantin. Photo # ST-C414-3-63, ST-C414-4-63, KN-C30566 & KN-C30560 & text courtesy of jfklibrary.org & Fabio Peîa. 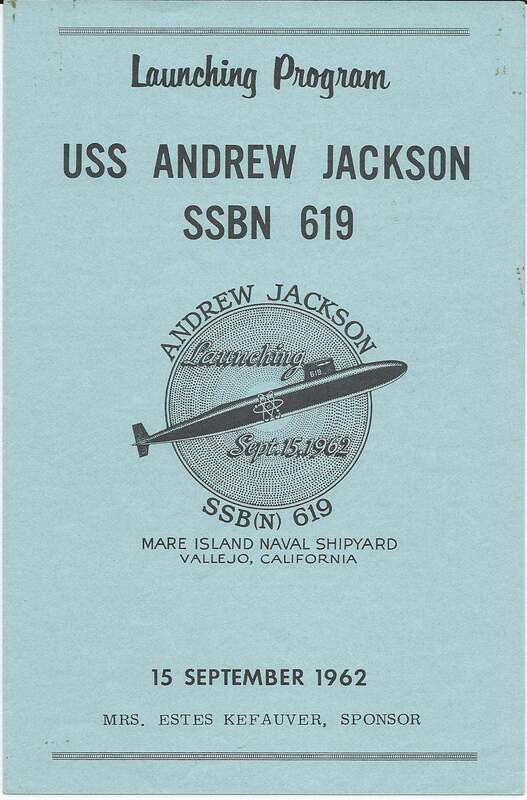 453k Front cover of an 8 page Welcome Aboard the Andrew Jackson (SSBN-619) pamphlet, circa 1973. USN photo courtesy of Scott Koen & ussnewyork.com. 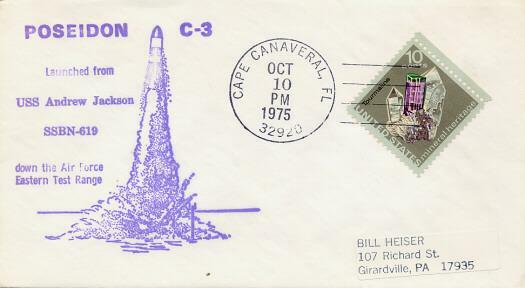 20k Commemorative post card marking the Andrew Jackson (SSBN-619) launching a Poseidon C-3 missile , 1975. Courtesy of Richard Leonhardt. 396k A starboard bow view of the nuclear-powered strategic missile submarine Andrew Jackson (SSBN-619) underway on 28 October 1985. 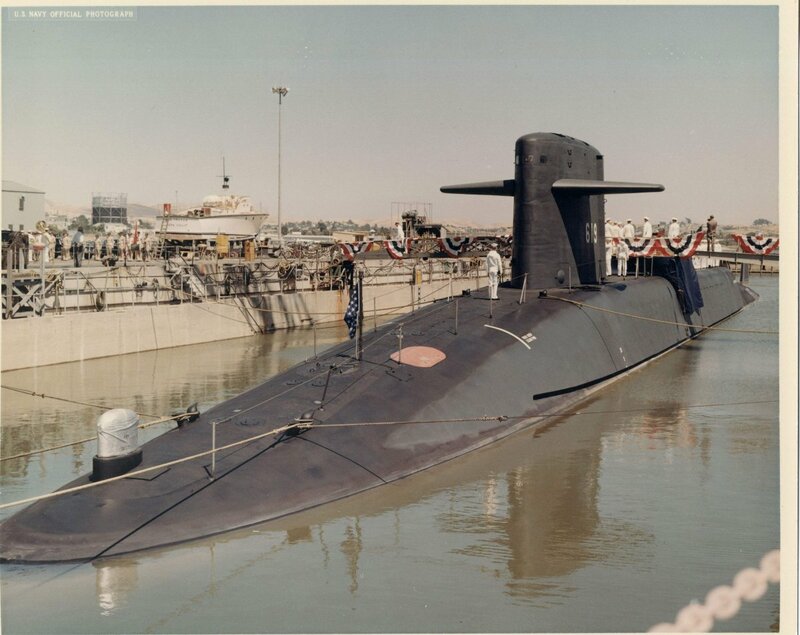 Official USN photo # DN-SC-86-00711, from the Department of Defense Still Media Collection, courtesy of dodmedia.osd.mil & submitted by Bill Gonyo. 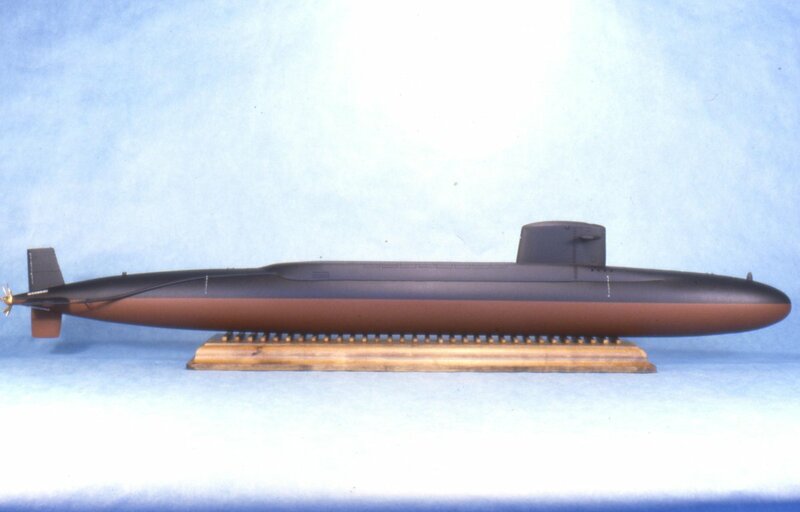 79k Andrew Jackson (SSBN-619) in 1/200 scale, starboard side view. Model and photo by Ken Hart. Andrew Jackson (SSBN-619) at Navsource.